Announcements Archive: Access an archive of chapter news, spotlights, articles and special resources shared with the AFPSS community. 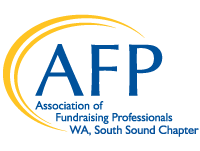 Chamberlain Scholarship: Each year, AFPSS provides $500 in travel support for a member of our local chapter to attend the AFP International Conference. (AFP International covers the recipient's registration fee, approximately an $800 value.) Scholarship applications are typically due in October, with selection made by year's end. Available to current chapter members only. Become an AFPSS member today for this and other benefits! E-newsletter: Members and non-members are welcome to sign up for AFPSS's monthly e-newsletter and special e-blasts, which include details about upcoming programs and events as well as member highlights and resources. We do not sell our list, and you can unsubscribe at any time. Member Directory: Look up and connect with other members you meet at AFPSS events or would like to meet. Available to current chapter members only. Become an AFPSS member today for this and other benefits! Mentorship Program: One-on-one matches between knowledgeable, well-rounded Mentors and Mentees who are relatively new to development or interested in learning more about a particular area in fundraising. Available to current chapter members only. Become an AFPSS member today for this and other benefits! Program Slides and Handouts Archive: Access presentation slides and handouts from past AFPSS educational programs. Available to current chapter members only. Become an AFPSS member today for this and other benefits! For questions about any of the resources here, please email afpsouthsound@gmail.com. Over the next several months, we will be exploring incorporating the following additional resources into our website. Thank you for your patience as our volunteer committee members work on this. If you have feedback, please get in touch with the Marketing and Communications Committee Chair. Discussion Forum: A members-only discussion forum to pose questions, connect digitally and dialogue about current issues in the field. Library: A members-only space for sharing and browsing useful links, example materials and more.